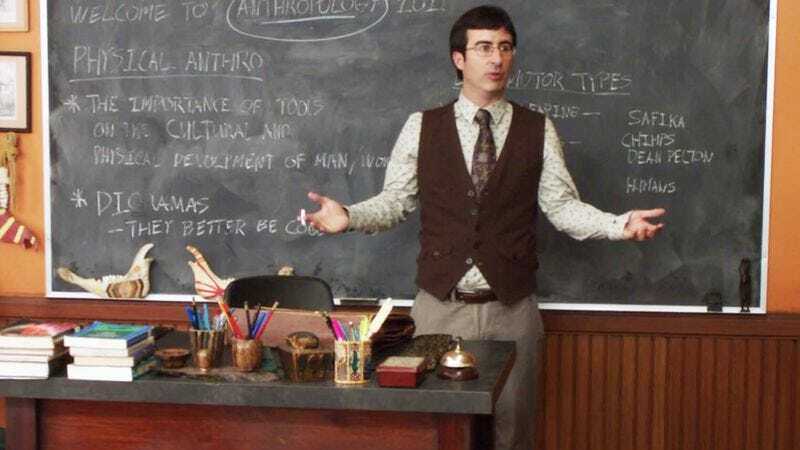 Continuing its tradition of enlisting actors from beloved, respected shows, Community is bringing in John Oliver, from the beloved, respected first season of Community. According to TV Line, Oliver will assist the returning Dan Harmon in recapturing the early feel of the show, minus the part where Donald Glover and Chevy Chase are there, by reprising his role as Professor Duncan in at least six episodes. Duncan was last seen in the second season episode “Applied Anthropology and Culinary Arts,” and thereafter he was only alluded to in self-referential quips about him not being around lately and through the brief appearance of his name on a textbook. That long and mysterious absence will presumably be explained with the obsessive detail demanded by fans who have long wondered where he’s been, or maybe they’ll just stick him in Glover’s place and assume no one will care or even notice. After all, he can also rap.